by Associated Press, December 22, 2000. ANKARA, Turkey (AP) -- An Assyrian priest stood trial Thursday for inciting religious hatred for allegedly backing international calls for Turkey to recognize the Ottoman Empire's killings of Armenians early this century as genocide. Turkey says that hundreds of thousands of Armenians were killed while the Ottoman Empire tried to quell civil unrest, but insists the killings didn't amount to genocide. Prosecutors charged Yusuf Akbulut with causing ethnic and religious hatred and demanded his imprisonment for up to three years. He allegedly also said that Assyrians were among the victims. Akbulut, of the Assyrian Virgin Mary church in the southeastern city of Diyarbakir, denied the allegations and said his conversations with local reporters in October were published without his consent. 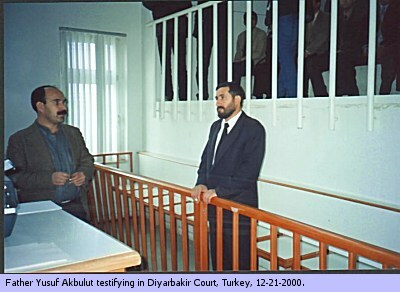 The court in Diyarbakir adjourned the trial to Feb. 22, to study a video tape of the interview. A leading human rights activist, Akin Birdal, also faces prosecution for reportedly referring to the killings as "genocide." Dozens of writers, intellectuals and journalists have been jailed under Turkish laws which limit freedom of speech. In November, the European Parliament called on Turkey to recognize the killings of Armenians in the Ottoman Empire early this century as genocide. Earlier, the French senate recognized the killings as genocide. In the U.S., a House resolution recognizing the Armenian genocide was shelved early October after President Bill Clinton warned that its passage could seriously damage ties with Turkey. by Reuters, December 22, 2000. DIYARBAKIR, Turkey (Reuters) -- A Turkish court on Thursday began the trial of a Syriac priest accused of "provoking hatred" by telling newspapers that his Christian minority community had been victims of genocide by Turks. 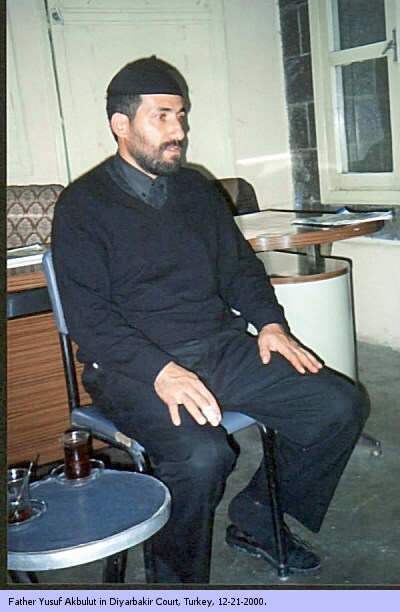 Witnesses at the State Security Court in the southeastern city of Diyarbakir said Father Yusuf Akbulut had contested the charge leveled against him, which could earn him between one and three years in jail. He was quoted earlier in the year as saying that Turks had systematically killed Syriac Christians in the southeast at the turn of the 20th century. He made the comments after a U.S. congressional panel approved a resolution characterizing the killings of Armenians in the latter days of the Ottoman empire as genocide. "I was chatting (with journalists) off the record. I was not giving my personal views but what was said by my elders at the church and by those who came to visit. I do not support the Armenian genocide bill, and I do not accept the accusations in the charge sheet," Akbulut told the court. The hearing, watched by a number of western diplomats, was adjourned until February 22. A few thousand Syriac Christians, one of the world's oldest denominations, live in Turkey's mainly Kurdish southeast, formerly the site of fierce conflict between Turkish forces and separatist Kurdish rebels of the Kurdistan Workers Party. by Istanbul Hurriyet in Turkish - 06 Oct 00 p 14. Diyarbakir -- Just when the so-called Armenian genocide resolution passed by the International Relations Committee of the US House of Representatives has been causing tension between the United States and Turkey, the police arrested Yusuf Akbulut, the priest of the Syriac [Suryani] Holy Mary Church in Diyarbakir, for his statement that "Along with the Armenians the Syriacs too were subjected to genocide." Yesterday, at around 0930, a team from the Public Order Department of the Security Directorate went to the Holy Mary Church in the Alipasa district. They told priest Yusuf Akbulut, in front of locals and foreign tourists, to get ready and go with them. In the meantime the DHA [Diyarbakir News Agency] correspondents Ramazan Yavuz and Ozgur Cebe, who were waiting by the church door, were driven away from the street by the police. 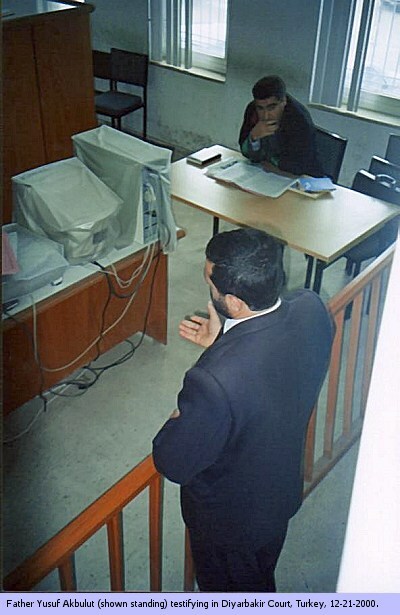 After confiscating the camcorders and photograph cameras of the journalists for a short time, the police took priest Yusuf Akbulut out of the church and brought him to Melikahmet Street via the back roads. 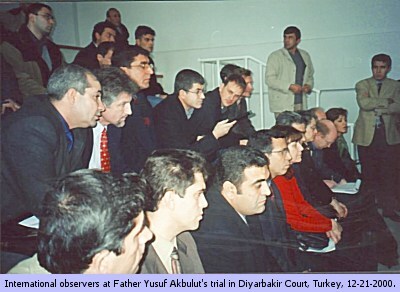 Priest Akbulut was then put inside the police car waiting there and taken to the Security Directorate. THE FOLLOWING NEWS ARTICLE WAS PRINTED IN THE TURKISH NEWSPAPER, HURRIYET. IT IS SHOWN HERE FOR INFORMATIONAL REFERENCE PURPOSES ONLY. Throughout the whole 2O th century, the Turkish state has refused to recognize the Genocide of 1914. This is a taboo issue in Turkey and anybody raising this issue is considered a traitor. This is what happened quite recently to a Syrian-Orthodox priest. 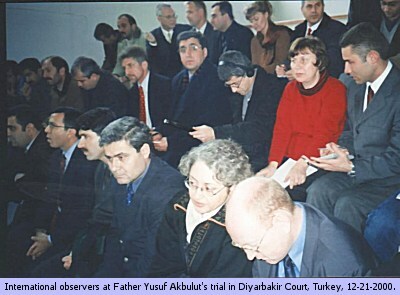 Turkish newspaper Hurriyet (04.10.2000)/ HRWF International Secretariat (27.11.2000) - Website: http://hrwf.net - Email: info@hrwf.net - The clergyman of the Syrian-orthodox (Suryani) parish of Diyabakir, priest Yusuf Akbulut, is supporting the draft of the alleged genocide of the Armenians, which was accepted by the subcommission of the US-House of Representatives. The priest of the Suryani Meryemana Church (Mother Maria) declared that the assertion about a genocide of the Armenians are correct and that also his fellow believers have been victims. As a pure invention the priest stated: "Not only the Armenians, also the Suryani [Syrian Christians] have been victims of the genocide, with the only reason that they are Christians. The Suryani have been massacred in great numbers (droves). And in this genocide the Kurds were used. "The homeland of the Suryani is Mesopotamia, and for the Armenians the provinces of Mush, Erzurum, Van, Erzincan and Sivas. The Armenians were settling in this areas. Why today there are no more Armenians, they have been a very big population at that time? In our area one remembers this time as "kafle". What means "kafle"? It means genocide. All people of this area are knowing the truth. I don't say this just for supporting the Armenians. What I am saying is that the fact of the genocide is correct. Nobody can deny it. I am a religious person, I am saying what is true." "They [the Turks] promised the Kurds, that who would kill 7 Christians, he will go to the paradise. And therefore also the Kurds who believed this, took part at this genocide. The Kurds which sometimes are visiting today our church are realizing this and feel sorry about it. In Mesopotamia, the real native country of the Suryani their numbers today are very reduced. But in the states of Europe they are very numerous. They have been forced to emigrate. Today there are no more repression against us. We feel more or less good, no more under pressure. We are content with our life. But we cannot deny history." Priest Akbulut made it clear that independent of the results of the discussions in USA the Suryani will raise their voices and will obtain a hearing to the world about what terrible times their forefathers went through." If you have any related information or suggestions, please email them.